"Everyone knows everyone in this small, friendly school with different year groups playing together and parents who are involved. A really solid, well-planned education with plenty of extracurricular clubs and activities, creating articulate, thinking pupils who have been listened to and encouraged to engage in, and have meaningful conversations about, all their learning." St Mary Magdalene Academy Primary is a one-form entry school for children ages 4 to 11 in the borough of Islington. Situated in a modern building, but with a long history, the school is a happy and ambitious place to learn and work. We have high aspirations for all pupils at our school. Our governors, staff, families and pupils all strive towards our core purpose: ensuring our pupils are happy and successful. We take great pride in the arrangement of our curriculum, the foundations of which are built on embedding core knowledge in literacy and mathematics. In particular, we view it is our mission to support our pupils to be confident readers. In literacy and maths, a carefully structured curriculum ensure our pupils attain the highest standards, leaving Year 6 school with both strong attainment and progress from their starting points. A strength of the school is our broad curriculum. Units of Inquiry provide a structured, integrated and thematic approach towards delivering a challenging, broad and balanced curriculum. As a church school, we are committed to providing high-quality religious education. Specialist teachers, often from the Secondary school, work throughout the key stages to deliver music, physical education and a wide range of languages. 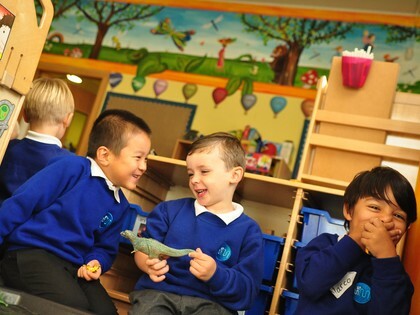 A vast variety of rich opportunities in which children participate are planned throughout their time at the school. These include a range of extra-curricular clubs, assemblies, trips (which take advantage of our location in London) and residentials and the chance to perform in our fantastic annual Shakespeare performance. A quick glance through our newsletter archive will give you a flavour of the extended curriculum we offer. A real sense of community is shared by all at our school. Pupils and staff are proud to attend and work at our school. Staff work together to improve teaching and learning and build strong relationships with families based on mutual support and trust. We are also very fortunate to be supported by an excellent and inclusive PTSA, which support all the school’s efforts. It is a privilege to have joined St Mary Magdalene Academy as Head of Primary in September 2016. I believe that high quality education can be a great equalising force in our society; it empowers people and is a key ingredient for their success. I am dedicated to supporting the all in our community to provide a rich and welcoming environment so that our pupils, flourish. We welcome visitors and look forward to showing you our school. is at the heart of our values and everyday actions.